I was very surprised and delighted that Rochelle had chosen one of my photographs for the prompt this week. 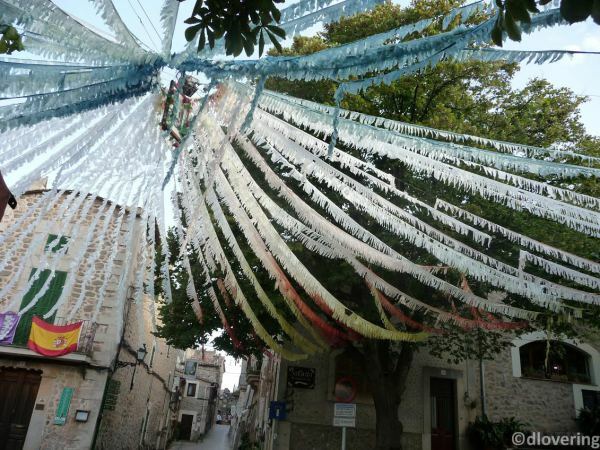 It was taken at the end of a fiesta in Valldemossa, a lovely little town in Majorca where we spent a very enjoyable day. It is so good to see the number of writers taking part in Friday Fictioneers increasing week on week, justification, if any were needed, for Rochelle to continue her sterling work. The dancer moves across wooden boards that shiver beneath his feet. A five-year old boy watches, marrying the dance with the music in his heart. The crowd holds its breath then finally erupts with cheers and applause. ‘Cristobal, Cristobal,’ their chants escape through the fluttering banners, rising up into the warm night. Alone in the shadows, the boy makes up his own steps. Stamping and twirling in his own time, imitating the uncle he adores; determination etched upon his serious face. All too soon the world will learn of his exceptional talent. For now though, his world is enough. This story was inspired by the amazing talent of Joaquin Cortes, a classically trained ballet and flamenco dancer. He was born in Cordoba and moved to Madrid where he attended ballet school. His uncle was a well known flamenco dancer. This makes me want to dance! Great tale! And thanks so much for the picture this week too. Thank you Nan, pleased you liked it. Thanks for the photograph and the delightful story that went with it. Beautiful. I could just see the little boy practicing his steps. Really touching! Dance does this- strikes a chord with all – young & old. Loved this- “marrying the dance with the music in his heart”. Good to hear from you and pleased you liked the story and my photo. I pirouetted down the hallway after watching the nutcracker. I love this snapshot of time before greatness, when the seed is planted and love of dance begun in a boy. Lovely story. So pleased you liked this Dana. The image of you pirouetting down the hall made me smile, as I expect you were also doing at the time. I did wonder about the title and by way of an explanation – I read an interview with Cortes in a newspaper a couple of years go and the reporter mentioned something along the lines of … for a very talented and famous performer he is a very private and unassuming person… or something like that. Plus having the boy dance alone in the shadows, the title just seemed so apt. Thank you Janet. I wanted to portray the intensity of the little boy’s passion for dance and music and the great dancer that he grew up to be. So pleased you liked it. Such a sweet story, and told in a very lovely way. You had me rooting for the kid, and feeling quite happy in the end. Loved that last line! Thank you for reading, happy that you were happy at the end! I’ve seen flamenco danced here in Tenerife occasionally. It’s so unashamedly sensual and I love it. Good to hear from you Liz. I’ve only seen a flamenco danced once and it is something I won’t forget. absolutely beautiful– the photo, the video and your story. OLE! Got my Spanish blood to turning my hands into castanets! Terrific subject matter, Dee! The classic success story well-told. Gold stars all around! I looked at the video, too, since I like this kind of stuff. Gee whiz, flamenco sure has changed since the days of Jose Greco! Thanks Kent. The video is quite something isn’t it? I think I selected one that had more ballet than flamenco, but I think it highlighted his exceptional skills. “A five-year old boy…” if you just say “a boy,” it’s enough for us to approximate the age. saves two more words. if it’s rising, it’s going up. don’t need up. instead of “makes up,” consider “creates.” one word instead of two. it’s also a more artistic word, whereas “makes up” sounds less important, less serious. okay. ten words. i bet you can do great things with ten words. it was lovely, now it can be even more lovely. i hope you don’t mind me taking liberties with your great work. also, instead of “the boy makes up…” you can say “he” instead of “the boy.” now eleven words to play with. this is the kind of thing i have tried to stress to people. take your time, work with it. look at it forwards, backwards, sideways, and then you get almost a dozen more words to add. maybe i’m nuts, but i find it a lot of fun. Hi Rich, thank you for taking the time to go through my work and for your constructive comments. There are a few points you made in your earlier comment that made me smile, as I had taken words out “finally” – “up” …but after reworking I had saved some words, so put them back in, though I did think “up” was unnecessary for exactly the same reason as you. I will rework this and see what it looks like. a private dancer perfecting his graceful moves. delightful story. thanks for sharing your photograph this week and the video clip. Thank you for the lovely photo. It’s inspired a wealth of unique stories, hasn’t it? You told a lovely story, complete with past, present and future as we see impending fame on the horizon for the boy. A mixed blessing. The video is stunning. Yes, the photo has inspired such a variety of stories – haven’t read them all yet – but I will try to. So pleased you liked the story and the video, he has an amazing talent. I hope his impending fame and fortune don’t change him too much. At least he has the present to be a child. Dawn, pleased you liked the photo and the story. Rich always has constructive criticism which is great and he’s certainly on form this week! Sorry you can’t view the video, perhaps if you just went into YouTube on your pc, not via WordPress? I had problems with photos and videos, happily they seem to have been resolved. For some reason, I am suddenly needing to change the pixels on ALL of my photos for posts… MUCH more time consuming. Not sure where the problems stem from; I’ve contacted support, but no luck yet. I’ll try checking out YouTube… I noticed that some photos in older posts of mine are blacked out now… eek. I have found Rich’s feedback dead on, in many posts. Is this just a recent thing or has it been going on for a while? Perhaps there is something wrong with the template you use, sometimes the older ones have little pesky gremlins – have you though to changing it? I thought this was really good Dee, very graphic, I could just see it. And I think ‘all too soon the world will learn of ….” is just perfect, because this might be the most enjoyable period of his life, without the stresses and strains of fame and fortune. Not everyone enjoys being ‘discovered’; sometimes that’s when the real problems start. Well done. And thanks for a great pic. Thank you for such positive comments Sandra, I really appreciate you taking the time. I think you have taken from it what I was hoping to portray, the pure joy of music and dance before celebrity and fame arrived. Pleased you like the photo too. Such a positive story.Most enjoyable. Thanks for the picture, Dee, and for your beautiful, vivid story. I loved picturing the little boy learning to dance in his own way, and the powerful descriptions you used took me right there. Thank you for your kind comments Jen, they are much appreciated. Thank you for the picture this week, Dee. I enjoyed the story ending with the small boy dancing. He clearly inherited a great talent. I also loved the video clip. What grace the man exhibits and what effort he’s put into training! He has complete control over his movements. I love flamenco. Well written story. Thank you Patricia, nice to know you liked the story. The video was amazing wasn’t it? What a talent he has for both ballet and the flamenco it seems effortless. I could see the entire story unfold. It was beautiful. The photograph inspired a lot of good stories this week. So glad to be writing again and corresponding with you. As for your story, I wouldn’t change a thing. It is so good to hear from you and I’m pleased you liked my story. I am very happy that you are writing again, I have missed both your writing and our conversations. I’ve missed our conversations also. More so, than our writing. Giggle. Can’t wait to read more of your stories. Away this weekend, but will catch up next week.